DLK on Avenue is proud to offer a variety of high quality injectable fillers which are administered in a professional, medically-supervised environment. Injectable fillers can plump thin lips, enhance shallow contours, soften facial creases and wrinkles, improve the appearance of recessed scars and dark under-eye circles and sagging earlobes. DLK’s Injectable Treatment procedure takes place in a medically supervised clinic after a consultation. During the consultation, patients can outline any specific concerns and needs they may have and different filler products will be discussed that would be best suited. A customized treatment program will be developed and each patient’s individual concerns and goals will be met. A facial injectable is a gel-like substance injected into the skin. The goal of an Injectable Filler is to improve your appearance by smoothing lines, wrinkles and restoring loss of volume. Injectable Fillers are used most often to smooth away the lines around the nose and the mouth, to enhance lips and to restore lost fullness to the cheek and chin area. There are many Injectables including Hyaluronic Acid, Calcium hydroxylapetite, and Collagen. Hyaluronic acid is a normal component of human skin that holds water and causes a plumping effect. Injectable Filler Treatments take approximately 15-30 minutes and results are immediate with minimal recovery and little-to-no downtime. Treated areas may be slightly swollen and red following the procedure, but these effects generally disappear within a few hours to a day. It is recommended that the patient return two weeks after treatment for a follow-up appointment to ensure that the results are optimal. It is important that the amount of movement or sleeping on the area injected be minimized for the next 48-72 hours (e.g. minimize smoking and/or drinking from a straw, sleep on your back). Treated areas might feel numb, swollen, firm, or sore for a few days and may appear bruised. When treating dark under-eye circles, there can be bruising and swelling following treatment that can last for a few days as a result of the tissue under the eyes being thin and more sensitive. These can be treated with the use of cold compresses and sleeping on 2 pillows for head elevation. Injectable fillers results are typically immediate and often a single treatment session will achieve the desired improvement in the area of concern. Different products vary in duration and effect. 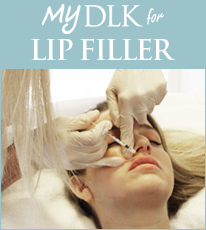 All of DLK’s filler products have been clinically studied and proven and have an excellent safety record. Temporary injectables last from 4-6 months up to 2-3 years. No injectable is 100% permanent and all will require repeat injections to maintain the desired effect.